DrJ uses its testing, building design and installation experience to help innovation flourish. How Can DrJ Benefit Your Company? 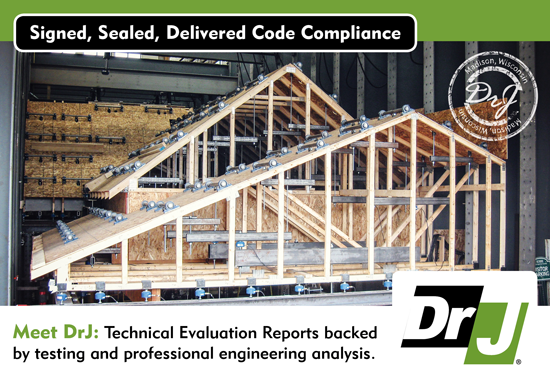 Through a generally accepted engineering practice and a professional engineering review, DrJ creates “product evaluation reports” or technical evaluations. DrJ provides product design information, specifications and installation instructions backed by testing and generally accepted professional engineering analysis. The engineering seal on our engineering mechanics drawings or Technical Evaluation Reports (TERs) says that DrJ has reviewed and vetted the resistance engineering and/or compliance with the relevant building code. How Can DrJ Support Your Product? Two companies stand behind the creation of alternative materials, designs and/or methods of construction — the product manufacturer and DrJ. We are uniquely qualified as the only civil engineering firm that is an ISO/IEC 17065 accredited product certification body through ANSI Accreditation Services. DrJ's goal is to work alongside innovative companies to bring existing and new products, processes and services to the market professionally, reliably and cost effectively through our unique certification services and generally accepted engineering practice. Contact DrJ to learn more and get started.